Mill-Max has added the Vertical SMT SuperSpeed Universal Serial Bus 3.1, Type C to its line of USB IO Sockets. This receptacle is 2X faster than USB 3.0 with more efficient data transfer, higher through-put and improved I/O power efficiency. Mill-Max already carries the USB 3.1 Top Mount and Mid-Mount style receptacles. 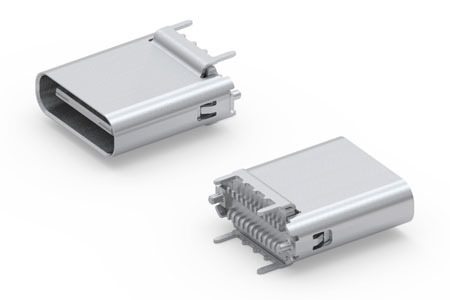 • Reversible USB Type C Connector. The type C connector style has no polarization so cables, with type C plugs, may be connected regardless of orientation. • 2X faster than USB 3.0 (up to 10 Gbps) with more efficient data transfer, higher through-put and improved I/O power efficiency. • Provides optimized power efficiency to reduce drain on portable device batteries. Mill-Max also carries USB SMT and through-hole, Types A and B, compatible with USB 1.0 and 2.0 specifications; USB 3.0 through-hole mount sockets, Types A and B receptacles; USB 3.0 Micro-B SMT Sockets, Type B Receptacles and Mini USB SMT Sockets, Types A and B. For more information use the links to the right for additional product details, or to find related products. Need technical help? Use the form below to contact Mill-Max Technical Services.